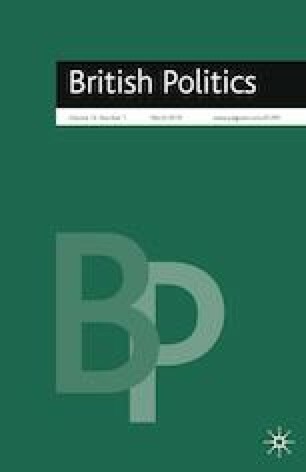 Conventional wisdom has it that the British first-past-the-post electoral system (FPTP) fosters an all-British two-party system which in turn provides territorial integration to a multi-national British state. While the first relationship has been significantly weakened since the early 1970s, the second one lost much of its compelling power at the General Election of 2015. However, as this analysis shows, the integrating function of the British party system has been a myth for quite some time. The FPTP system may have helped to concentrate votes in the two major British parties, yet it has also heavily exaggerated the existing electoral divergence between different parts of the country and has thus contributed considerably to the disintegration of the UK polity. As this effect becomes increasingly obvious, strong commitment to unionist ideology might be expected to induce corresponding support for electoral reform in both the Conservative and the Labour Party. The territorial concentration of their MPs (in part a consequence of this exaggeration), though, means that career self-interest points in the opposite direction. Wyn Jones, R., G. Lodge, C. Jeffery, G. Gottfried, R. Scully, A. Henderson and D. Wincott. 2013. England and its Two Unions. The Anatomy of a Nation and its Discontents. London: IPPR. http://www.ippr.org/files/images/media/files/publication/2013/07/england-two-unions_Jul2013_11003.pdf. Accessed 26 Oct 2017.